GET READY FOR YOUR NEXT DREAM VACATION! Imagine yourself vacationing in Nantucket in this exquisite, professionally decorated oceanfront home here on Ocean Isle Beach! Swing open the five sets of double doors to catch the ocean breeze and gaze out to the beach. This exquisite oceanfront home has all the amenities that only the most discerning guests will appreciate. Get a restful night’s sleep in one of its six luxury bedrooms. Each of the well appointed, spacious bedrooms has its own luxurious private bath. A powder room is in the living area. There is a separate "bunk room" with two sets of built in bunks that will delight the kids! A second floor children's den has an Xbox 360. The well-equipped, gourmet kitchen features custom cabinetry, granite countertops and top of the line stainless steel appliances (including a Thermador 24" refrigerator and 24" freezer - equivalent to two refrigerators,) two dishwashers, and a double oven. This home is handicap friendly with an elevator to all floors. Beautiful hardwood floors throughout except bathrooms are tiled. Feel totally relaxed in comfortable furnishings and appealing décor. Flat screen TVs in every bedroom, with a large flat screen HDTV and DVD player in the living area and kids’ den. Additional amenities include wireless internet and telephone. 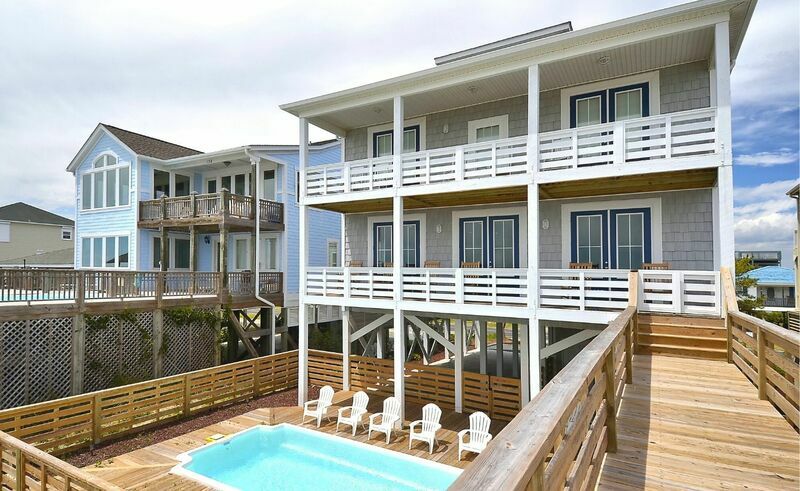 Plenty of rocking chairs available on the two oceanfront balconies that overlook the private swimming pool. Picnic table. And don't forget those miles and miles of beautiful white sand on this south facing beach. This unique and luxurious home will accommodate 24! Bedding: K, K, 2Q, 2Q, 2F, 2F, 2BB. The kitchen, the custom walnut bathroom vanities, and custom furniture created by Zack Wiggins of Zack Wiggins Designs, Inc.
All bed and bath linens provided in this wonderful accommodation. Non-smoking, no pets. My family and I stayed in this beautiful home for Thanksgiving 2014 and it was absolutely perfect The decor was lovely, the kitchen was well-stocked, and the view of the ocean was breath-taking. Everyone in my family had a wonderful time and we look forward to renting this property again in the future. Absolutely PERFECT!! The house is stunning, well appointed, the furnishings are all super comfy. We all had a great time and look forward to coming back again next year.